Booklet format for two-sided printing. Print this file duplex and staple the center to make a booklet. Single-page format for eReaders or to print a large-print edition. Print this files duplex with “print to fit” selected. Printed copies of the booklet are available for purchase ($2.75) at Lulu. Save 10% when you buy 15 or more printed books. Lulu is constantly using different coupon codes (last year they had a really good one on the day after Thanksgiving). Printed copies of the booklet are also available for purchase ($3.99) at Amazon. This option may be necessary if you want a printed copy in a hurry. 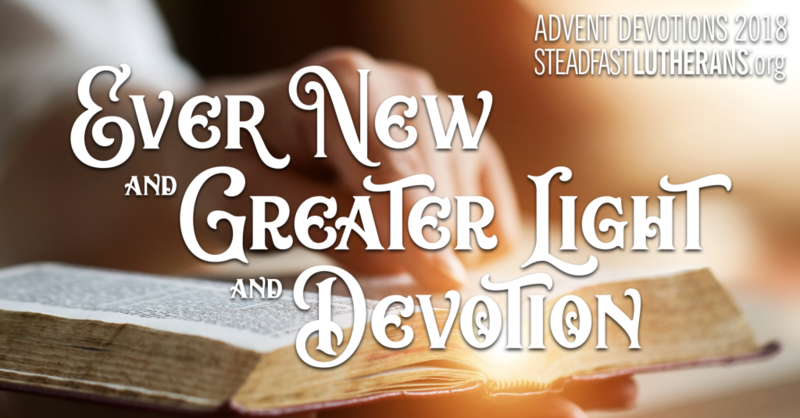 This advent devotion takes us as Lutherans back into very familiar ground, the Small Catechism. Here we find the foundations of our faith, the basics upon which the rest of our beliefs and practices are built. There is always a temptation to think these things are too basic or that we have mastered them already and can learn no more. This is actually a sin against the Third Commandment to think such things. Each of us have a sinful nature, an Old Adam, and he is a horrible theologian – and yet too often we listen to his teaching. So like Dr. Luther, we go back to the Small Catechism each day. The underlined section is the foundation to the theme of this series. The Holy Spirit works through the Word, and the Catechism is a pure confession of that Word. This Advent hopefully is just a continuation of this practice for your household, but in case it is not, let this be a fresh start. There is much blessing to be found in such practice, not the least of which is the passing on of the faith to the next generation. May God indeed do that for you and yours this Advent. Pastor Joshua Scheer is the Senior Pastor of Our Savior Lutheran Church in Cheyenne, Wyoming. He is also the Editor-in-chief of Brothers of John the Steadfast. He oversees all of the work done by Steadfast Lutherans. He is a regular host of Concord Matters on KFUO. Pastor Scheer and his lovely wife Holly (who writes and manages the Katie Luther Sisters) have four children and enjoy living in Wyoming.